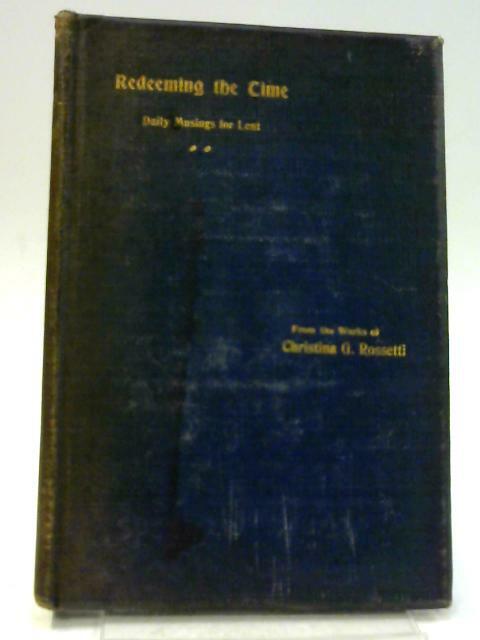 Redeeming The Time by Rossetti, Christina G.
1903. 95 pages. No dust jacket. Blue boards with gilt lettering to front board and spine. Cracks to hinges, text pages tight. Light tanning and foxing to text pages with light tanning, water marks and foxing to endpapers and text edges. Front endpaper is missing. Scraps, small bumps, dog ears and chips to text pages edges. Uneven text pages. Softening to spine with mild bleaching to spine, boards and edges. Water marks to spine, boards and edges. A few marks, wear and bumps to spine ends, boards and edges. Small bumps to corners with bumps to boards edges.